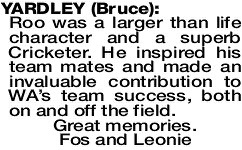 "Mum's boy Bruce". Adored son of Vera and Gordon (both dec). Ros, Anth (dec), Charlie, Susanne, Amanda and Rachel. 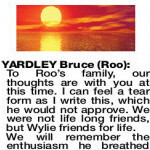 To Roo's family, our thoughts are with you at this time. I can feel a tear form as I write this, which he would not approve. We were not life long friends, but Wylie friends for life. 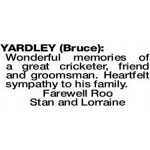 YARDLEY BRUCE Wonderful memories of a great cricketer, friend and groomsman. 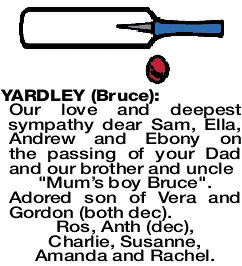 Heartfelt sympathy to his family. 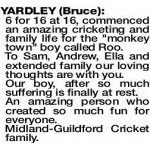 YARDLEY BRUCE 6 for 16 at 16, commenced an amazing cricketing and family life for the "monkey town" boy called Roo. 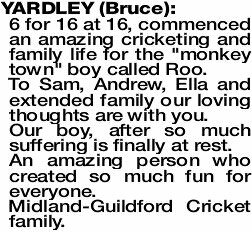 To Sam, Andrew, Ella and extended family our loving thoughts are with you. Our boy, after so much suffering is finally at rest. An amazing person who created so much fun for everyone. 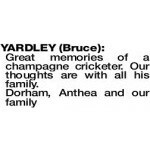 YARDLEY BRUCE Great memories of a champagne cricketer. 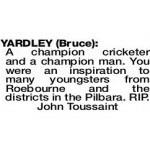 Our thoughts are with all his family. 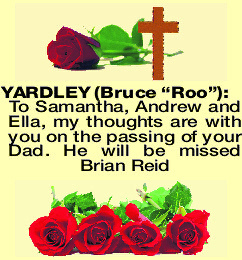 Andrew, Samantha and Ella, our thoughts are with you on the sad passing of your Dad. Rest in Peace. David, Denise and family. You were such a wonderful friend. Kind, generous, so funny and very brave. We are sad, we will miss you but have lots of happy memories of the good times. Deepest sympathy to Sam, Andy and Ella, you were his world. With love Julian, Marg, Jason, Adam and Family. A sparkling diamond. Farewell old friend. 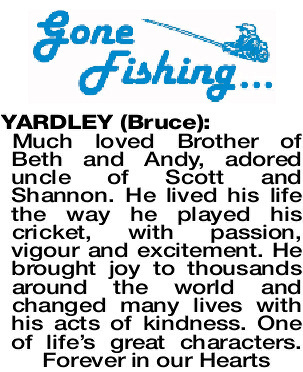 Heartfelt sympathy to his much loved children Sam, Andrew and Ella. You had a very special Dad. Mike and Bev O'Shaughnessy. `Have lost a lifelong mate. Will miss you always. 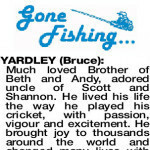 Catch you later Bruce. Karl. 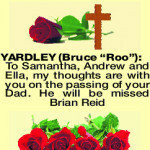 Heartfelt condolences and thoughts to his three great kids whom he adored. 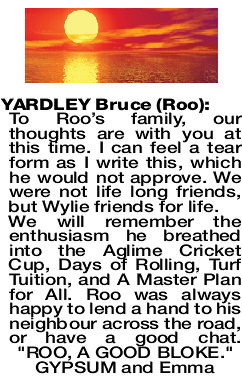 Roo was a larger than life character and a superb Cricketer. 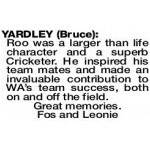 He inspired his team mates and made an invaluable contribution to WA's team success, both on and off the field. 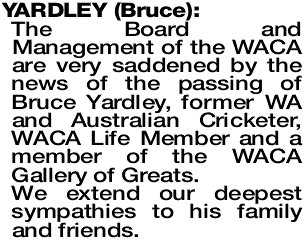 The Board and Management of the WACA are very saddened by the news of the passing of Bruce Yardley, former WA and Australian Cricketer, WACA Life Member and a member of the WACA Gallery of Greats. 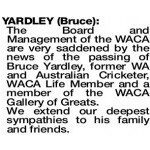 We extend our deepest sympathies to his family and friends.